2. Place the emergency pressure control lever in the EMERGENCY position. 3. Using HIGH PRESSURE REGULATOR, apply pressure specified in table 12-6 to the regulator inlet. Slowly turn the INLET PRESSURE ON/OFF valve to ON. 4. Draw a film of leak detection compound (MIL-L-25567) across the regulator outlet fitting. As in the last test, see if there is any distention of the film. 5. There is no allowable leakage. If leakage is noted, locate probable cause using troubleshooting chart, table 12-7. 6. Place the emergency control lever in the NORMAL position. OVERALL LEAKAGE TEST. Test, by trapping pressure in the regulator, for any leakage anywhere on or in the regulator. Perform the overall leakage test first with diluter lever in its 100-percent OXYGEN position, and then repeat it with the lever in the NORMAL OXYGEN position. 1. Place regulator oxygen supply valve lever in the ON position, and emergency pressure control lever in the NORMAL position. 2. By using test stand HIGH PRESSURE REGULATOR, apply pressure specified in table 12-8 to regulator inlet. 3. Turn INLET PRESSURE ON/OFF valve to OFF. Leave the regulator oxygen supply valve lever in the ON position. 4. Leakage will be indicated on the regulator pressure gauge. Allowable leakage should not exceed 60 psig over a 2-minute period. Repeat the test with the diluter lever turned to NORMAL OXYGEN. Table 12-6.Inlet Pressure (Oxygen Supply Valve Leakage Test) 12-12 5. If allowable leakage is exceeded, locate the probable cause by using the troubleshooting chart, table 12-9. 6. Turn the HIGH PRESSURE REGULA- TOR to VENT. 7. Bleed the regulator by placing the emer- gency pressure control lever in the EMERGENCY position. Return the lever to NORMAL. 8. Bleed the test stand using the SYSTEM BLEED valve. REGUI.ATOR PRESSURE GAUGE SCALE AND ERROR TEST. This test ensures that the pressure gauge is operating properly and within tolerance. To perform the regulator pressure gauge scale and error test, proceed as follows: 1. Turn the INLET PRESSURE ON/OFF valve to ON. The LOW PRESSURE REGULA- TOR can only be used when applying pressures below the gauge guard setting (165 to 175 psig) to an item under test. For pressures above the gauge guard setting, the HIGH PRESSURE REGULATOR must be used. 2. 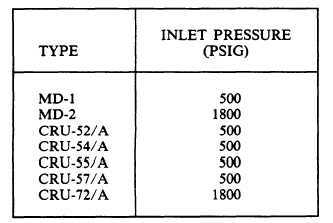 Using LOW PRESSURE REGULATOR (N), slowly increase the pressure to each test pressure in 100 psig increments and below, as specified in table 12-6. Record the regulator pressure gauge readings twice, once before and once after tapping regulator pressure gauge. 3. Check the tolerance by comparing the regulator pressure gauge reading with the test stand INPUT PRESSURE gauge. 4. Back out on the LOW PRESSURE REGULATOR. 5. Continue the test for 500 psig pressure by using the HIGH PRESSURE REGULATOR. 6. Turn the HIGH PRESSURE REGULA- TOR to VENT. 7. Bleed the test standby using the SYSTEM BLEED valve. Bleed the regulator using the emergency pressure control lever. OUTWARD LEAKAGE TEST. In per- forming this test, the relief valve is not covered. The allowable leakage through this valve at 17.0 inches H2O is included in the maximum allowable leakage of 120 ccm. NOTE: This text uses the abbreviations lpm for liters per minute. Newer equipment and technical manuals may use the correct abbreviation, which is L/min.